A piece inspired by Twin Peaks, of protagonist Agent Dale Cooper (right) and his evil doppelganger “Mr. C” (left). 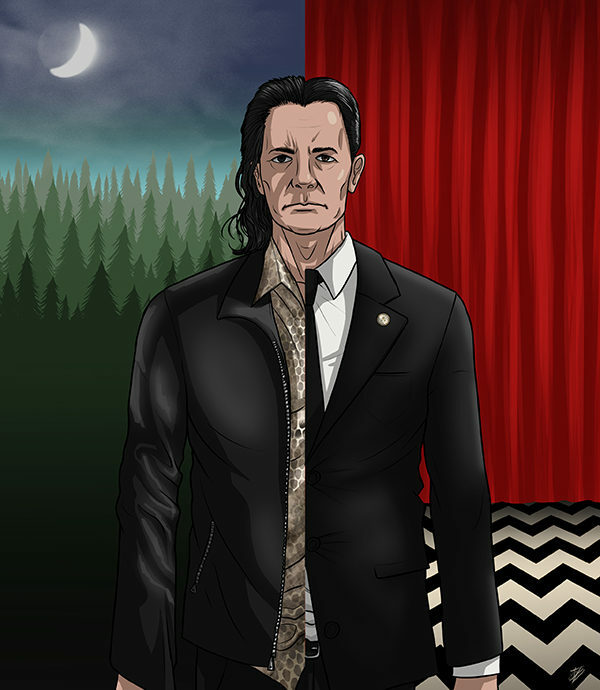 The two backgrounds of the Black Lodge’s Red Room for Cooper and the forests of Twin Peaks for Mr. C were inspired by the DVD cover for the Season 3 DVD boxset. This is what I spent a whole day off doing, with a new boiler being fitted about 10 feet away from me the whole time. I just had the idea to do this and a quick sketch quickly got carried away and became this. I think the biggest challenge with this piece was getting the snakeskin pattern on Mr. C’s shirt right, but I think I got away with it.